In these pink, glittery magazines I don’t read except when bored in a waiting room there’s always tips on how to handle a break-up. Frankly, they don’t look very useful to me, but lots of people seem to find help there so who am I to judge. Nonetheless, one of the tips that I’ve seen come up a lot is “get a haircut, show him what he’s missing out on”. Women get a haircut after a break-up; it seems to be an indisputable law of life. I’d never do something that stereotypical over a boyfriend, but at the end of last year, right after I wrote my final-final exam, I did have a very drastic haircut. I cut almost a foot of hair off. And when people asked about this (of course they did, it had been a very obvious change after all), I used to joke that I cut it after my break-up with my English degree. But in a weird way it became true after I started to say it. Finishing university and going out unprepared into the unregulated, crazy world of a working adult was as traumatic as a break-up and I should have handled it as such. I tried to act like it was no big deal, but it wasn’t true. You need time to grieve and to adjust. I learnt that it would have been okay to not be okay after such a drastic change in my life. It took six months for me to be steady on my feet again. Granted, I have a whole host of other issues that probably slowed my healing process down, but I should still have given myself the time to recover from the upheaval of the “break-up” that turned out to be more than a joke. If that made any sense at all. I’ve read lots of books where fear the emotion is made out to be an actual antagonist in the plot. Authors who’ve used this plot device that come to mind right now are J.K. Rowling, George R.R. Martin and Maureen Johnson. But that’s what I’ve always taken it to be: a convenient plot device. It’s just a thing to say in a book. It’s not real. It was only this year that I realised that it is real and true. I’ve talked a bit about this before; stress in healthy amounts can be an energiser and catalyst, but fear is only ever a paralytic. It does not achieve anything except damaging your productivity or your mental health. I am a nerd. I’m completely fine with this. Not everyone else is. Still, there’s nothing wrong with nerdiness. This year I learnt that it takes a lot of courage to not care what people think of you. The campus of a university is much more accepting than the general world of people who go to work and come home and feed the dog and watch sports and read the newspaper. In the time between high school and job hunting I forgot that being nerdy or weird and different is still really not fine for a lot of people. You have to be brave to not care and continue being who you want to be. I’m not quite there yet, but I’m working on it. Tying in with point 3, you are allowed to have your own opinion. This includes music, movies, books, anything like that. It seems that people want others to like the same things that they like. You want to change others’ minds so that they share your opinion of things. For me it was the other way round. If someone else doesn’t like the same book or movie that I do, then I felt that there is something wrong with me. Why do I like something that public opinion is against? Only this year I realised that is okay. My best friend is much better at this than I am. She doesn’t look at book or movie reviews before buying or watching something. She looks on the back of the book and maybe reads the first few pages. She decides for herself because when you buy and read a book it is you and only you that matter. You can’t go off opinions on the internet to decide if a book will be good, because those people do not have the same taste as you. Of course they have the right to their opinion. That’s totally cool. But I also have the right to my opinion. It’s okay, I will watch that movie you don’t think is any good at all. I won’t ask you to watch it with me. You can reread that book for the third time even though I didn’t like it because we don’t need each other’s validation, only acceptance. So, how about you? Did you learn anything new in 2014? We’re almost to 2015 here. Just over an hour to go. This nerd is watching documentaries on DVD for new year. And someone is wrong number calling me again… It was pouring with rain earlier which had me hoping that all the firework parties would rain out, but now it’s stopped so no such luck this year. 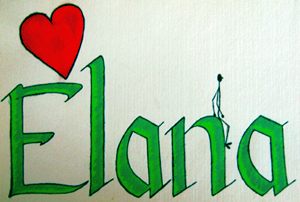 This entry was posted on December 31, 2014 by Elana. It was filed under Life updates and was tagged with fears, life lessons, looking back, memories, mental-health, nerd, new year, self-acceptance.